It’s 1985. You’re a walnut brand looking to imbue your grocery-store products with an aura of impossible glamour. What do you do? Obviously, you hire All My Children mainstay and living legend Susan Lucci to host a “World’s Richest Recipe” contest. And that—best as I can figure—is why this full-page ad from a November 1985 McCall’s exists. Please note that Lucci is wearing the diamond necklace, bracelet and earrings they are offering for grand, first and second prizes. One of the reasons the part is so much fun for me is that she and I are so different. One thing we do have in common, though, is a taste for the finer things in life. 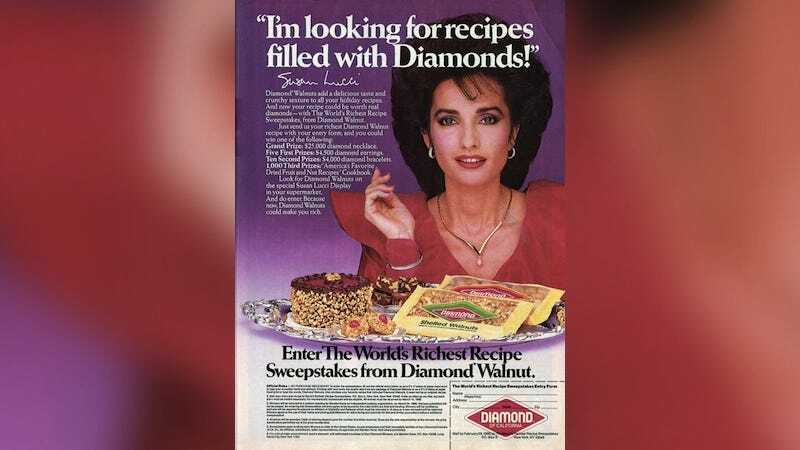 Both of us would absolutely adore the $25,000 diamond necklace that will be given away as the grand prize in the Diamond Walnut World’s Richest Recipe Sweepstakes. Please allow this ad to serve as your inspiration over the coming holidays.